Who I am and what I have done in the past is probably not that important to you. What I can do to help you become a more effective golfer or instructor in the future is more of interest to you I am sure. I became an expert on designing, installing and sustaining programs in large and medium sized organizations that measurably improved and sustained performance that was crucial to improving profits and the success of that firm. These included large organizations in the airline, banking, retailing, manufacturing and financial fields. I was with Emery Air Freight when I started looking for a process that would produce targeted performance change around the world in that organization. I went to a workshop held at the U. of Michigan that talked about using Applied Behavior Analysis to change human behavior in schools, mental institutions and prisons. The lights went on for me. I saw that all organizations should change and maintain human performance they targeted using a behavioral approach. Some employees hold that working in their organization is similar to working in a mental institution or prison. When I returned to my office, I suggested that Emery Air Freight set up a new department that would measurably improve performance throughout the company using these techniques. Every performance we aimed the programs at measurably improved. What was so rewarding was that they improved quickly, often in the first hour. When I left there in 1973, Emery had become the most profitable company on the New York Stock Exchange. Business Week ran several articles on the program, which drew wide interest. Later, they asked me to appear in a featured role with Professor B. F. Skinner in a film called Business, Behaviorism and the Bottom Line. His peers voted Professor Skinner the most influential psychologist in the world. He is the originator of the basic underpinnings of the behavioral approach. I left Emery in 1973 to set up Feeney Assoc., a management-consulting firm. Twenty minutes after starting, the Senior Vice President of a major airline phoned to ask me to improve performance among a thousand airline reservation agents. For over twenty years, we measurably improved performance in all types of companies and departments using the behavioral approach. For example, I wrote a sales training and coaching program that the forerunners of Fed Ex Ground used for 25 years. The experts in my field were kind enough to give me a Lifetime Achievement Award for my work in applying these programs in organizations. I always enjoyed playing golf and was able to win some 20 or so club tournaments of all types. I began to develop my Behavioral Golf Instruction process and used it on my game to lower my handicap to 1.6 at the age of 73, the lowest I had achieved and at an age when most golfer’s handicaps have risen substantially. I finished in the top three in Senior and Super Senior State Tournaments in the three states where I eventually resided. In Virginia, I went to the last hole in a five- day medal and match play tournament one up. I put my tee shot on a hole that was 195 yards up hill and against the wind. I mentally visualized my trophy when my opponent, a former State Amateur Champion made a hole in one. Ah well. Golf has given me so much pleasure. When I saw so many people struggle to improve, I decided that my behavioral background might be of some help to golfers and instructors. That is when I began to research golf instruction with as much effort as I did large organizations. I interviewed over 150 golfers in great depth on their experience in taking or not taking golf lessons and over 100 instructors on what they did or did not do in giving lessons. Observations of hundreds of lessons helped even more. I instantly saw many steps in giving and taking golf instruction that needed to change and that would lower the average score of all golf students quickly, regardless of their prior experience. Using this information, I designed and successfully tested Behavioral Golf Instruction. One day I suddenly decided to try to change how golf instruction is given and taken all around the golfing world. To make a dent in golf, I decided to write a book, open a web site, give workshops, write articles and make presentations to large organizations or professional instructors. Companies amply rewarded me as the President of my management consulting company. Therefore, I decided to make this contribution to golfers and instructors without charging them anything for what would be millions of dollars of consulting time and advice to a business client. I respect the advice of many people that tell me I should charge for this help, but I have decided otherwise. Because there are so many instructors and far more golfers around the world and there is only one of me, I am going to need the help of many people in spreading Behavioral Golf Instruction. 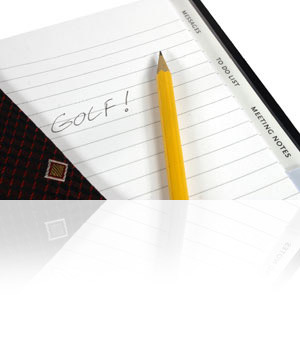 May I count on you to apply these ideas and spread the word to everyone you know in golf?